IdealCup™ is a staunchly proud Aotearoa-New Zealand made product and business, owned by passionate Kiwis, Steph (pictured) and Nick Fry. IdealCup™ is operated and managed from a base in Motueka, in the beautiful Nelson-Tasman region; with a logistics and distribution base in Wellington. IdealCups™ are MADE IN NEW ZEALAND and this is something we won't waiver from. They could be made in China for a lot less, but that's not how we roll. We strongly believe in keeping production in New Zealand, to support local business, provide opportunities for local suppliers and third-party businesses, and, of course, to offer employment opportunities right here in our own backyard. IdealCup™ has won a few awards for its design and environmental credentials. We're proud and thankful for those accolades as they confirm our belief in what we're doing. We're about keeping it local, keeping it NZ made, making sure our product is truly sustainable, and making sure we do our bit to help keep beautiful Aotearoa/New Zealand and our planet green! In 2008, our sister company Celcius Coffee completed an audit of waste produced in a year by its day-to-day operations. One of the main sources of waste to landfill was disposable cups,which went into the waste stream after one use – we were not happy! We decided there must be a way to reduce this waste and concluded a reusable cup could be an option. We researched reusable cups already in the market and couldn’t find anything we felt was suitable. 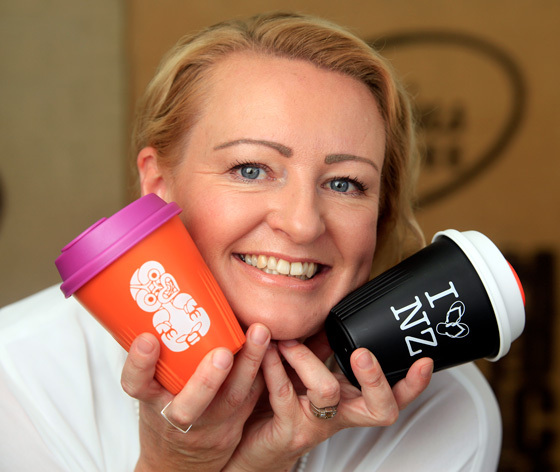 We felt Kiwis needed an alternative to the nasty disposable cup so we channelled our entrepreneurial spirit and began the process of designing and manufacturing NZ’s first reusable coffee cup – the IdealCup™. In 2010 the process was complete and the IdealCup™ was born, and we set out on our journey to provide people with a way to REUSE and say goodbye to single-use takeaway cups! Designed to reduce disposable cup waste going to landfill! IdealCup™. Walking the talk for a better world. Join Us! Kiwis are in the top 10 takeaway cup consumers in the world. Every day thousands of takeaway cups are disposed of in Aotearoa/New Zealand, ending up in landfill. Our love of the ‘daily takeaway’ is a real concern for our environment. At IdealCup™ we don’t like to sit around and simply talk about our concerns. As an honest-to-goodness sustainable business, we try and pioneer ways of doing things better. By keeping production local and using sustainable products for manufacturing we minimise our carbon footprint, offer opportunities for other local businesses, and keep skills in New Zealand. So come on Kiwis, wrap your hands around an IdealCup™, hold it up proudly, knowing you are joining our efforts to keep our nation clean and green… whilst supporting Aotearoa/New Zealand made! If you’re not a Kiwi, you too can join the revolution, order some IdealCups™, and help the reusable cup message to go global. While IdealCup™ is very much about saluting the individual reuser, but we're just as focussed on reducing waste on a much larger scale. After researching business and large event waste, it's clear there's a need for everyone to work more closely in these areas to resolve the issue of nasty, disposable cups hitting the landfill. In 2014 we kicked off our larger-scale focus in great fashion by partnering with Oxfam New Zealand and their annual Trailwalker event. Oxfam decided it would make its Trailwalker event disposable cup free for the first time. More than 95% of Trailwalker participants used an IdealCup™ during the event and the audited results of the event showed an epic reduction of 37% of disposable waste to landfill. Now that's sustainability in action! To this day, we continue to develop our large events offering and to provide effective and easy to implement tools and resources for the business office, corporate conference, outdoor event, or festival.